Joe Bill is widely regarded as one of the best Teachers of Scenic and Comedic Improvisation in America today. He first encountered Improvisation in 1977, when he learned some basic games for performance in his group at Broad Ripple High School in Indianapolis, IN. By 1990 Joe has performed professionally with 5 different Sketch Comedy and Improv groups, studied with Del Close at Improv Olympic, and with Martin DeMaat, Michael Gellman, Bernie Sahlins and others before graduating from The Second City Training Center, Co-founded the Annoyance Theatre (all in Chicago), and was making his living as a Nationally Touring Stand Up Comedian. 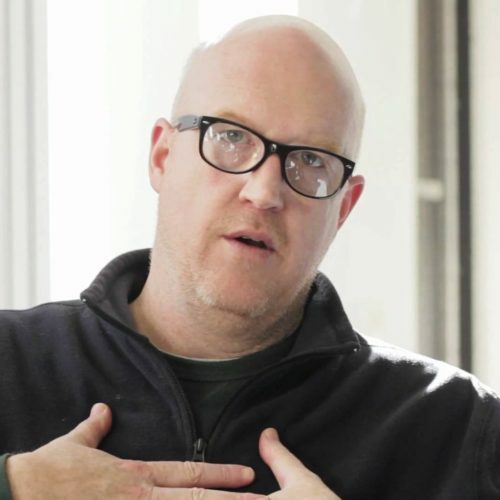 It was also 1990 when his passion for teaching Improvisation kicked into high gear, and a unique approach to Improvised Scene and Character began to be articulated by a number of teachers at Chicago’s Annoyance Theatre, lead by the visionary Artistic Director of Annoyance, Mick Napier. Since then Joe and Mark Sutton (his partner in the Nationally Touring Improvised Production, BASSPROV), have evolved the Annoyance approach into POWER IMPROV, which they both have been teaching all over the U.S., Canada and Europe, at Festivals, Theaters and Universities since 2000. Joe has performed, coached, directed and innovated Improv Structure with a vast number of successful groups including The Screw Puppies at Annoyance, Georgia Pacific at iO Chicago, with whom he developed The Bat, The Throwdown at Donny’s Skybox at Second City and The Playground and The Scramble which he has taught and directed in 9 cities in the U.S. using performers from a mix of Theaters and Groups in each city. Joe has taught and or performed at every major Improv Festival in The United States, and in addition to BASSPROV, he also tours and performs with Minneapolis Improv Mastermind Jill Bernard in their 2 person show, SCRAM!, which features 3 different 2 person scenes that happen at the same time. Joe currently teaches and does corporate training at iO Chicago, is an Artistic Associate for The Chicago Improv Festival, and acts as an Artistic Adviser for a number of Improvisation and Comedy Theaters all over the U.S. and Canada. "Playing With The Languages of Impro/v "
"In this workshop we will explore everything about the languages of improv. These include: Verbal, Physical and Emotional Language The Languages of Truth and of Humor The Language of Scene, Narrative & Game Improvising in your Second (or 3rd or 4th) Language Improvising in Multiple Languages at the same time Improvising Social & Political Satire This workshop will probably be best for Intermediate to Advanced Improvisers and especially beneficial for multilingual improvisers. I will also provide personal feedback for each improviser and will be open to addressing any curiosities about Language in Improvisation that students bring into the workshop. "The focus of this workshop will be providing students powerful, specific tools to help you connect and respond to your scene partners while improvising. I’ll show you how to play with - Emotional depth to bring richness to the ordinary - Emotional & Psychological listening to discover more possibilities in the moment - A strategic point of view to sharpen your Characters and Scenes - A vital presence to serve yourself and your scene partners, your scenes and shows We’ll work with understanding the differences & similarities in playing Game, Narrative & Long Form Characters. I’ll include personal feedback with tools you can use going forward. This workshop is perfect for all improvisers, regardless of skill level, and will provide you LOTS of reps in the improv gym to practice using the tools that I share with you."